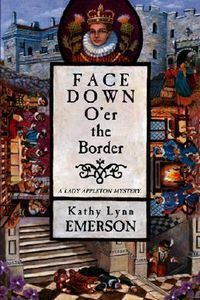 Face Down O'er the Border by Kathy Lynn Emerson: Synopsis and Online Purchase Options. Synopsis (from the publisher): The year is 1577. Mary, the abdicated queen of Scots, is a prisoner in England. Her son and heir James is a boy of just eleven, and the regents keep dying. What does Scotland's political unrest have to do with what seems a purely domestic crime, the murder of Catherine Glenelg's mother-in-law? More than Susanna Appleton would like. Even if she can find her friend Catherine, who has disappeared in the company of a notorious spy, she knows Catherine won't cross o'er the Border without her children. And rescuing eight-year-old Lord Glenelg is dangerous because his presence has been commanded at the royal palace as the young king's reluctant schoolfellow.